4.3.7 Prescription of PSDs-To support the head and thighs. 4.3.8 Prescription (selection) of PSDs-supporting lower legs and feet. with additional postural support they may need. It is very important that prior to the prescription (selection) of a wheelchair that an extensive and accurate wheelchair assessment process has been completed as further changes following this stage can be more difficult to make. 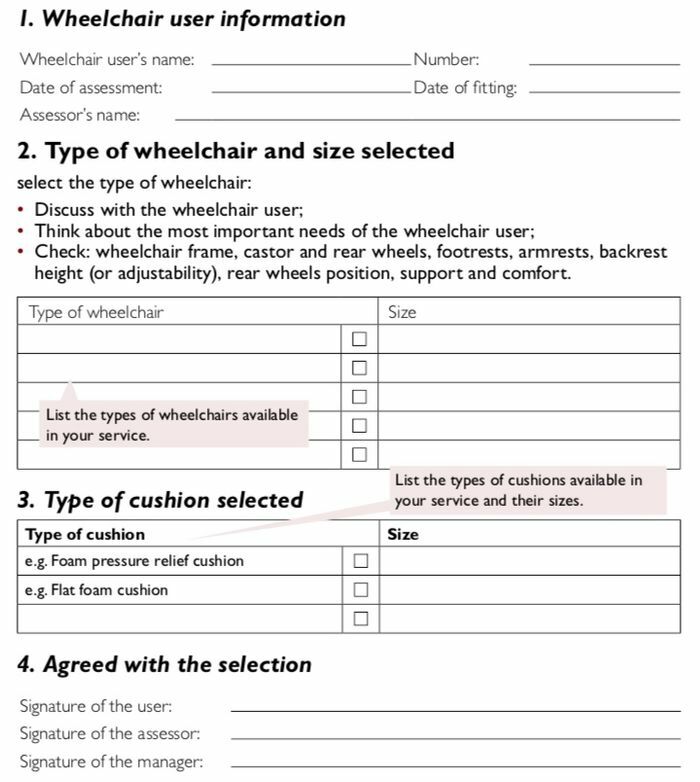 You can review the Wheelchair Assessment Process in more detail here. It is very important to select the right wheelchair .The correct size wheelchair is more comfortable, helps to support upright sitting and is easier for the wheelchair user to use. Frame, for example, whether it is a long or short wheelbase; the frame length; whether it is a cross-folding or rigid frame. Features including the type of seat, backrest, footrests, armrests, castor wheels, rear wheels. Wheelchair Size; This is usually described by the wheelchair seat width and sometimes also the depth.The seat height from the floor is also very important to know. Adjustability Options; Adjustment is usually possible to two or more different positions.For example, most wheelchairs have which can be adjusted to different heights spaced evenly apart. The “range” of adjustments is from the smallest to the largest measurement. 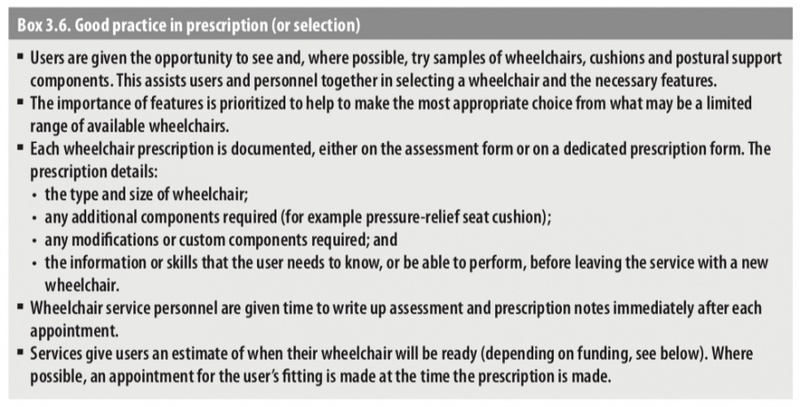 Cushion; Determine which type of cushion (if any) is provided with the wheelchair or check can it be available separately. NOTE: Wheelchair measurements, weights, features and sometimes optional parts are often mentioned in this information. Always check whether there is information available about the wheelchairs you are prescribing. Kindly read this information so that you are familiar with the products. If suppliers do not give this information, do not forget to ask for it. The prescription (selection) needs to be written down. Adapt a form for your local service by listing the types of wheelchairs and cushions available in your service and sizes available. Selecting the PSDs or modifications needed to provide the wheelchair user with additional postural support he/she needs. The prescription always needs to be decided in full partnership with the wheelchair user. adjustments possible and adjustment range. Wheelchair service personnel need to know the different types of frames that are available locally.For example is the wheelchair a three-wheel or four-wheelchair; a cross-folding or rigid frame;tilting frame; long or short wheelbase. Wheelchair size is usually described by the wheelchair seat width and seat depth. The wheel chair seat width is measured from the outside of one seat rail to the outside of the opposite seat rail or between arm rests if these sit on top of seat rail. The wheelchair seat depth is measured from the front of the seat to the backrest. Possible features include the type of seat, backrest, footrest, armrests, castor wheel, rear wheel and PSDs (for example side trunk pads, headrest, straps). This will include the highest and lowest setting for the footrests, whether the backrest height is adjustable, and whether there are adjustments possible in the rear axle position. Most wheelchairs have footrests that can be adjusted up and down.Some have additional adjustments including moving forward or backwards and footrest angle can be increased or decreased. These adjustments give more flexibility to where the wheelchair user’s feet can be placed. It can hold the foot up with knee extended. It is helpful for wheelchair users who cannot bend their knees to neutral for sitting. Hips that cannot bend to neutral sitting posture. Fixed bent posture of lower trunk. Fixed posterior pelvis tilt with hip and knee flexion contractures. To increase comfort and rest. More stability than a slung seat. This can be beneficial if a wheelchair user has strong uncontrolled movements or is very heavy. Is the cushion cover water resistant. Different designs of PSDs are available and many different ways that a wheelchair can be modified to provide a wheelchair user with additional postural support. Several different PSDs are often combined for one wheelchair user to provide the overall support he/she needs. Postural support device can be defined as a physical device that gives an additional postural support and it is an important element of intermediate level wheelchair service. Straps: Pelvis strap, anterior tilt four point strap, calf strap, foot straps-behind the heel, foot straps-around the ankle, foot straps-over the front of the foot and shoulder harness. A number of PSDs are used to provide support to the pelvis. A build up under the pelvis. When pelvis moves to one side, pelvis side pads can be used. A wedge for anterior tilt. An anterior tilt four-point strap. When one hip cannot bend to neutral sitting posture (trunk to thigh angle is more than 90 degrees), lower seat front on one side can be used. When both hips cannot bend to neutral sitting posture (trunk to thigh angle is more than 90 degrees), an open seat to backrest angle can be used. When one or both hips cannot open to neutral sitting posture (trunk to thigh angle less than 90 degrees), raise of seat front can be used. Pelvis support is provided by pre seat bone shelf, rear pelvis pad, pelvis strap (not always necessary) and pelvis side pads (not always necessary). Backrest support is provided by adjusting the backrest shape. Additional support can be provided by tray, shoulder harness and seat and backrest tilt. Pelvis support is provided by pre seat bone shelf, rear pelvis pad and opening up the seat to backrest angle and pelvis strap (not always necessary). Backrest support is provided by backrest recline and adjusting the backrest shape. When trunk leans or falls to one side , PSDs solutions are trunk side wedges and trunk side pads. To support fixed or flexible sideways curve of the spine ,trunk side pads combined with pelvis side pads can be used. Prescription of PSDs-To support the head and thighs. To support the head , flat headrest and shaped headrest can be used. To support the thighs, when legs are drawn outwards (abducted), the PSDs solutions are outside thigh wedges and outside thigh pads. To support the thighs, when legs drawn inwards (adducted), the PSD solutions are inside thigh wedges and a knee separator pads. Prescription (selection) of PSDs-supporting lower legs and feet. Adjust the footrests backwards if possible. Adjust the angle of foot rests. Shorten the seat lightly if the front of the seat is pushing on the back of the wheelchair. For a tall wheelchair user consider raising the seat front or tilting the seat and backrest. Provide a standard elevating leg rest. 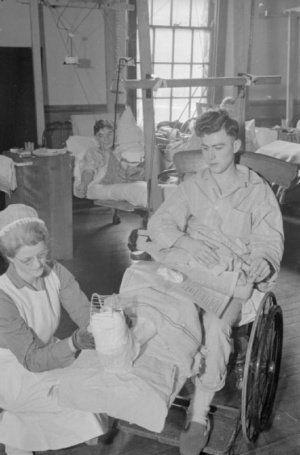 Consider providing a 3-wheeled wheelchair if available. Add footrests to the top of horizontal centre bar. Extend footrest forward by adding wood or metal. Extend the footrest hanger to more forward .